R-44 no. 5396 trailing an A train on the IND Fulton Street Line at 80th Street/Hudson Street. Photo by David Pirmann, April 2009. 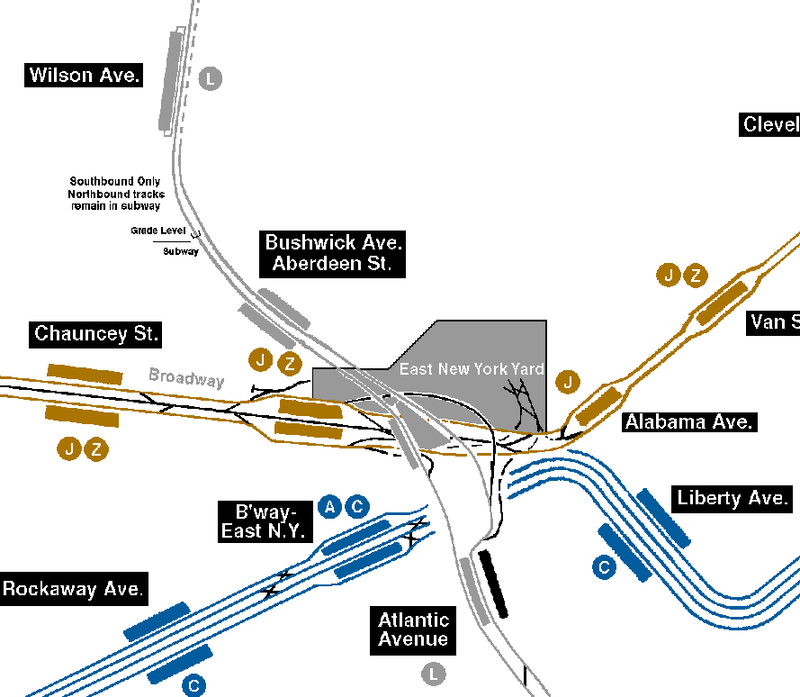 The 1933 High Street (A,C) and Jay Street (A,C; later F) stations are described as part of the IND 8th Avenue Line. These stations opened first, in February, 1933, along with the original 8th Avenue line to Brooklyn. The IND South Brooklyn Line (opened in March 1933; today's F & G trains along Smith Street and to Park Slope and Church Avenue) which join at Hoyt-Schermerhorn Streets with the two portions of the IND Brooklyn-Queens Crosstown Line (opened in two stages in 1933, 1937) to Court Square, Queens, are described on the IND Crosstown Line page, keeping the complete "G" train route on a single page. 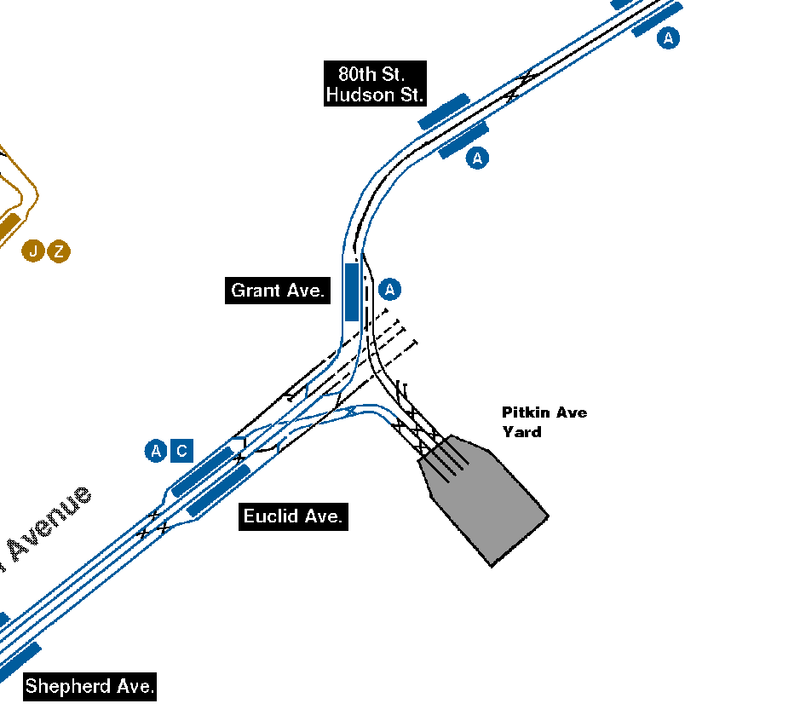 The 1936 IND Fulton Street Line from Court Street station, through Hoyt-Schermerhorn Street, to Broadway Junction, Euclid Avenue, and Lefferts Boulevard is described on the IND Fulton Street Line page. The 1936 York Street (F) station is described as part of the IND 6th Avenue Line. The 1950s addition of the Rockaway branch to the Fulton Street line is described on the IND Rockaway Line page. The 1950s connection of the BMT Culver elevated stations to the IND South Brooklyn Line between Church Ave. and Ditmas Ave. is described on the BMT Culver Line page. The Court Street station is best known now as the site, since 1976, of the New York Transit Museum. The Fulton Street line was built in a similar manner to the Manhattan subway lines where the local trains terminate in Manhattan and the express trains continue to Brooklyn (the IRT East Side, West Side, and IND 8th Avenue lines follow this pattern). Court Street initially served Fulton Street local trains, but these were quickly replaced by "HH" shuttle trains between Court St. and Hoyt/Schermerhorn. Even these were discontinued after a short time because Court St. is so close to many of the other downtown Brooklyn stations. Court St. was open for passengers only from 1936 to 1946, and it remained closed to the public until 1976 at which time the New York Transit Exhibit opened as part of the U.S. Bicentennial celebrations. The photos of the station on this page were taken on fan trips, etc. before the Transit Exhibit opened. Six tracks, four island platforms. Tile color is light green with a Kelly green border; captions read "Hoyt". Four tracks are in service, the center pair serving the IND Crosstown Line, and the middle pair serving the trains to/from the IND 8th Avenue Line. The outer pair are used solely to connect to the New York Transit Museum, but have been used in the past for the "HH" local and shuttle service to Court Street. There is a new Transit Police substation in the mezzanine; also there are large blue-and-gold "L" signs, designating the site of the former Loesser's department store. Local station with four tracks and two side platforms. The tile band is deco green with a kelly green border; the name tablet reverses this color scheme. There is evidence of two possible closed exits here. The mezzanine has walkways both inside and outside of the fare control at the South Portland end of the station. Mosaic directional signs pointing to South Portland Ave. and to South Oxford Avenue can be found in the mezzanine. Fare control is in the center; the north end exit has high exit turnstiles. There is no free transfer between uptown and downtown, and no transfer to the adjacent Fulton Street station on the IND Crosstown line (but this can be done at Hoyt-Schermerhorn so it was probably not worth the extra cost to design these stations with a transfer). There are skimpy signs for the LIRR Flatbush Avenue station and the Brooklyn Academy of Music, which are within walking distance. Two side platforms, four tracks. Same tile pattern as Lafayette Av. On the southbound (toward Brooklyn/Queens) side, the fare control is at the north end at platform level. At the south end, exit is via high turnstyles only. On the northbound side, the fare control is at the south end, also at platform level. There is no exit at the north end. Two side platforms, four tracks. Same tile pattern as Lafayette Ave. This station has fare control at the south end, at platform level. A north exit to Classon Avenue is long closed. The only evidence of this exit are some blacked out "to Classon Avenue" tiles where the paint is fading allowing the underlying text to show through. This station was renovated in conjunction with the BMT Franklin Shuttle rebuild, with full elevator access to the platforms and in-system transfer to the Shuttle. Prior to the free in-system transfer, and prior to the Metrocard, a paper bus-style transfer was handed out at the token booth (the only place in the subway where this was still being done). After the introduction of the Metrocard, a paper Metrocard transfer was issued from a machine that resembles a bus farebox near the token booth. The transfer was good for twenty minutes only and could only be used to enter the shuttle station. Two levels, two tracks and two side platforms on each level. This station is an unusual two-level station with express service on the upper level and local service on the lower level. The original design of the station was as follows: Four tracks and two local side platforms on the lower level; typical IND mezzanine on the upper level. At some point during the construction it was decided to add express platforms here, so the way this was accommodated was by ramping up the express trackways east and west of the station to the level of the "mezzanine" and adding side platforms. The trackside walls on the lower level conceal the original trackways. The express platforms are wider than the local platforms to allow for the lower level stairways. Because of this obliteration of the mezzanine, there are separate fare controls at the east (Rockaway-bound) end of the upper platforms at platform level. There is, however, a sealed-off crossover here that was closed citing safety concerns. Tile band is of butterscotch yellow with a walnut brown border, a very warm and eye-pleasing combination of colors. The name tablet colors are reversed. Ad panels on the lower level have been tiled over with the same walnut brown highlights (presumably because the ad panels were constantly being defaced). There appears to have once been an exit at the west end; lower level directional signs point to "Arlington Place", but the ones on the upper level have been blacked out. Where the exit once was, replacement tile has been installed; the tile band takes on a much lighter shade of yellow, here, with a distinctly darker shade of brown at the border. Two side platforms, four tracks. Tile color is similar to Nostrand Ave. The fare control is at the south end of the platforms. Here too, the ad panels are are tiled over. This station was the site of an unfortunate incident in which a token booth was set on fire resulting in the death of the station agent. The fire extinguishing system had been disabled by the agents so that they could smoke. Four tracks, two island platforms. Tile color is maroon with a Tuscan red border. The station has been renovated. There are new old-fashioned light fixtures with modern sodium-vapor lamps in them. They are suspended on long rods from the high, vaulted ceilings. There is a free crossover. The center of the station slopes down and there is a lowered ceiling compared to the rest of the station. Running diagonally across the ceiling in the center of the station is an unused station shell intended for use as part of the IND second system. This station would have been a typical express station with four tracks and two island platforms. Stairways to them have been removed, but evidence can be seen on the ceilings of the Fulton line platforms. Also, climbing the steps to the intermediate level, there are some locked doors which could serve as access to the unfinished platforms. There are additional exits at the extreme ends of each platform which bypass the intermediate level and go straight to the fare control level. Two side platforms, four tracks. Tile color similar to Utica Ave. The station had a full mezzanine but the Howard Ave. end is long closed. Evidence was found in a painted-over mosaic "to Howard Avenue" which was found after a thorough search of platform and mezzanine. There is a name tablet present but the colors are not reversed. There is a crossover along with "To Ralph Avenue" mosaics. The ads are being tiled over, similar to those at Nostrand Ave.
Two side platforms, four tracks. Tile color similar to Utica Ave. The north exit, at Hopkinson Ave./Boyland St., has a mezzanine and crossover. 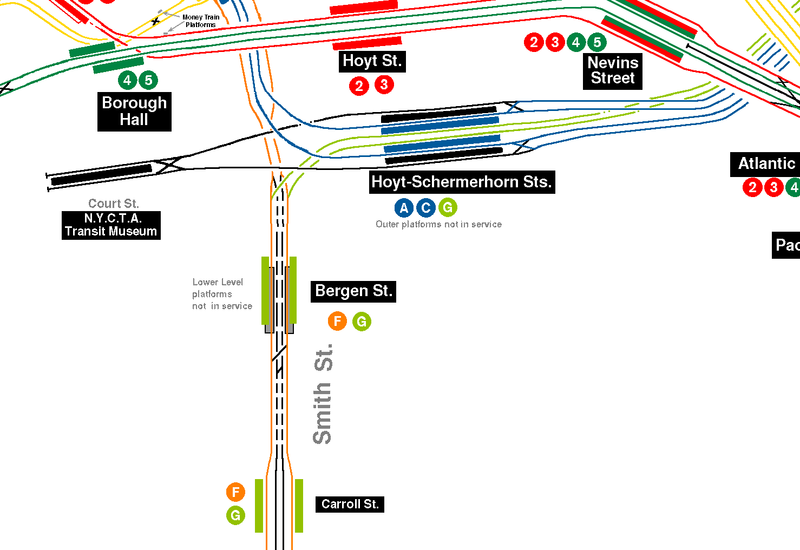 The south exit is at platform level and is at Rockaway Avenue. Express station with four tracks and two island platforms. This was the end of the line in the prewar IND work, although the station opened ten years after the rest of the prewar construction under Fulton Street. The stations farther south were added after the war. The newer stations had fluorescent lighting built in, a major innovation for the day, the late 1940s. The fluorescent lamps at the earlier IND stations was added in the 1950s to replace the original incandescent lamps. The tile stripe is blueberry with a Delft blue border, which is clear-glazed. Originally it was olive green with a black border; it was refinished around 1990. The center I-beams have some old black on white signs and some at the west end are white tiled. The fare control is at the Brooklyn-bound end of the station; this entrance also serves the J and L trains via newly-replaced escalators from street to elevated level. There's also a police precinct located in the mezzanine. If there was a former western end exit, there is no evidence of it any longer. There is an active tower just past the Rockaway-bound platform's head end, and south of the station are leadins for a proposed extension along the Jamaica Avenue el. Two side platforms, four tracks. The 10" x 5" wall tile is eggshell beige; the tile band is cornflower blue with an ultramarine blue border. There is also an ultramarine blue border at the base of the wall. The captions are white letters on a blue background and have more than one letter on each tile. The tablet colors are the reverse of the tile band. The station is lit with soft-white (pinkish) flourescent light, which gives off an ambient and very pleasing glow. The exit is in the center of the platform via a widening of the platform. There is a crossover, which has a "to Richmond Hill" sign painted on the tile, presumably referring to a planned extension of the line before the connection to the eastern end of the old BMT Fulton El. Two side platforms, four tracks. Again, 10" x 5" beige wall tile, cornflower and ultramarine blue tile band, like at Liberty Avenue. The exit is in the center of the station with fare control and mezzanine above. Two side platforms, four tracks. Same design as Liberty and Van Siclen Avenue stations except the stairway leading to the mezzanine is positioned differently - you make a U-turn down a short corridor to get to it. Express station, four tracks and two island platforms. Same 10" x 5" eggshell beige wall tile as the previous three stations; the tile band, however, is a delicate shade of lilac with a violet border, similar to the Manhattan Delancey Street stop. The I-beams are tiled and feature mini vertical name tablets reading "Euclid" along with the two-tone border motif (see photo). Away from the station center, there is a single row of these I-beams running down the middle of the platform. The south end of both platforms has an elevated crew quarters. The station has a crossover in the mezzanine along with an active newsstand. East of this station, the trackwork is quite complex, first allowing for trains to enter the Pitkin Yard from either the express or the local tracks, then the connection to Grant Avenue station, also from either the express or local tracks. All four trackways continue, disused, east under Pitkin Avenue till approximately Elderts Lane. See the track map for an illustration. Two tracks, one island platform. This station has light green textured tile with a vertical "Grant" tiled on the I-beams and no name tablet. The wall tile is arranged "portrait" style - 5" x 10". The tile band is also laid out in a "soldier course" (full-height single tiles) and is dark chrome green with a celery green border. The mezzanine has an acoustic tile ceiling with fluorescent light panels set flush in it, and is at street level; it has a very 1950's feel to it. There is also a variation on the "soldier course" found here, with varying sizes of dark green tile with light green accents (see photo). Behind the stairs leading to the exit, the station ceiling is higher. At the south end of the station features the portal to the Liberty Avenue Elevated taken over from the BMT. A view into the tunnel from the south end of the platform reveals a third track entering from the right of the southbound track, having ascended from the yard. After clearing the portal, the line has a center track which is not in revenue service. Three tracks, two side platforms. Originally with low concrete walls but now has a windscreen along the platforms. The north mezzanine has a high exit, and the south end has the 24-hour booth and a crossunder. This station is popular with railfans for its view westward, where trains climb up onto the elevated structure from the Fulton Street Subway. Three tracks, two side platforms. Originally with low concrete walls but now has a windscreen along the platform. The south end has the 24-hour booth and a crossunder. There is a closed exit on the north end. Elevated, with a large mezzanine at the north end (Woodhaven Blvd./Cross Bay Blvd.) and a smaller mezzanine at the south end. A crossunder is at each mezzanine. This station is popular with railfans for its view of the junction to the Rockaways. Looking east, there is a short stretch of four tracks: the center two descend and go on to Rockaway, and the outer pair go on to Lefferts Boulevard. A new center track appears on the elevated structure to Lefferts Boulevard after the junction. Three tracks, two side platforms. There is a mezzanine similar to that at 80th St., and a closed exit at the west end. Looking geographically northwest of the station, you can see where the LIRR Rockaway Line tracks continued on northward. Three tracks, two side platforms. The west exit has a mezzanine and doors to a high exit while the east exit has the booth. The center track ends just west of the station. Two tracks, single island platform with exits at the ends of the platform. The north exit has employee facilities and a high exit and iron maiden turnstile. Tile here is light beige with dark green accents, installed in 1997. The south end has the bumper block. If there were plans to extend further, there are now buildings in the way which would make an extension more difficult.